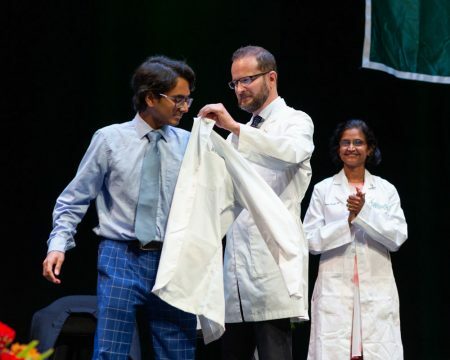 On September 15, 2018, 92 members of the Geisel School of Medicine Class of 2022 gathered with faculty, family, and friends for the school’s annual White Coat ceremony to don the symbol of their new profession. Roshini Pinto-Powell, MD, associate dean of student affairs and admissions and associate professor of medicine and of medical education, welcomed the first-year medical students to what she described as one of her favorite ceremonies at Geisel. She encouraged the future physicians to feel joy in the practice of medicine, and read a Mary Oliver poem, Song of the Builders, which encourages each of us, in our own way, to continue building the universe. 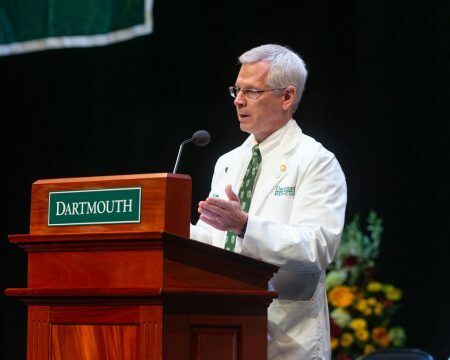 “On behalf of the faculty and staff, we are dedicated to giving you the best medical education in the country,” said Dean Duane Compton, PhD. An avid hiker, Compton used hiking as a metaphor for the journey through medical school—a great deal of preparation is required prior to beginning a hike, but once on the path the thrill of what lies ahead is intoxicating. “You are now on the path, this is your journey, but you are not on alone,” he said. “We are walking that path with you and today we formally acknowledge your journey. In addition to words of welcome and wisdom from Geisel faculty and fellow students as they received their white coats, students also found notes from Geisel alumni welcoming them to the profession of medicine tucked into the coat pockets. The Class of 2022 is Geisel’s 222nd MD class since its founding in 1797. The 92 students in the class, including 90 MD and two MD/PhD students, represent a small percentage of the more than 6,500 who applied to Geisel via the American Medical College Application Service.